The press is the perfect fit for any modern machine shop. It helps you get the job done properly, whether you are using it to make post-production adjustments on rods and axles or to fabricate metalworking jobs. Beside straightening metal, these presses can perform a wide range of jobs around your shop, including assembling and extracting. They increase efficiency by letting you use one machine, and one operator, to get the job done. 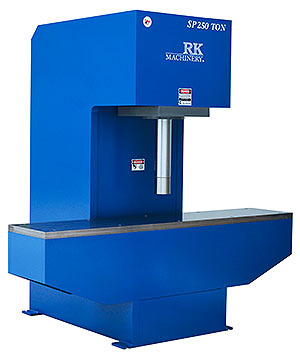 The hydraulic straightening press from RK Machinery, whether the SP-100, SP-150 or the SP-250, reduces the number of projects you need to scrap. It lets you make adjustments on the fly as you work on the metal. With more control, a greater number of jobs are done right the first time. Jobs are finished on time, and few man-hours are needed to complete a project.